We’ve had a busy road schedule over the past few weeks here at ModSquad: a speaking engagement, a hosted meet-and-greet for clients and industry insiders, and meeting old friends and new at industry events. Whew! Let’s dive in! First stop was the Opentalk conference at Pier 48 in San Francisco. 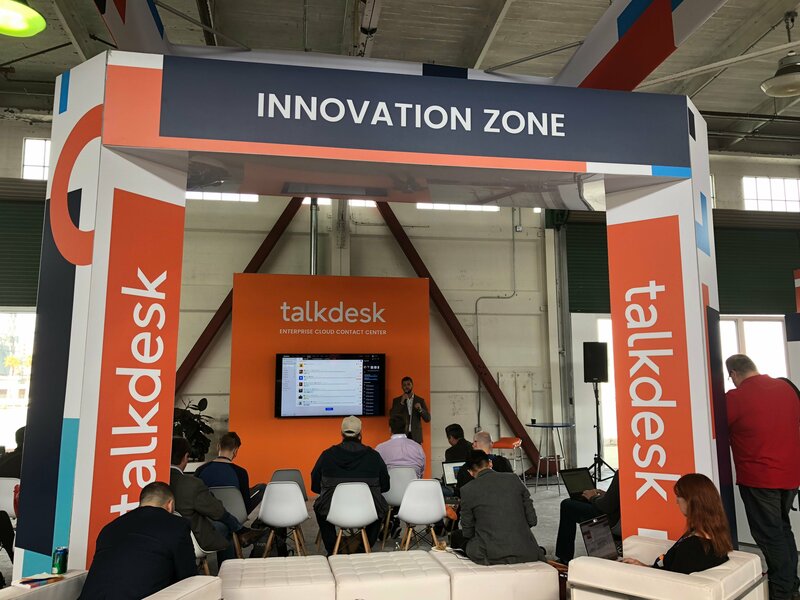 Hosted by ModSquad partner Talkdesk, a leading customer-support software provider, the company trumpeted their capabilities through product announcements and far-seeking roadmap presentations. CEO Tiago Paiva opened the event with a keynote talk that ran through the company’s history and enthused about their plans for growth. Their planned 4x jump is in no small way reliant upon the company’s omnichannel strategy, which looks to cover every expectation of contact center leaders. While AI and other tech were of course a key element of the company’s future capabilities, Paiva and other speakers consistently stressed the human element, the power of storytelling in every customer interaction, and those “magic moments” that lead to amazing customer experiences. From there, our intrepid digital-engagement mavens headed up to the Nob Hill neighborhood of the City by the Bay, to the Fairmont Hotel, where Zendesk’s Relate conference opened its doors. We’re fans of the Relate series, and this installment was no exception. Zendesk CEO Mikkel Svane kicked off the proceedings (in a very snappy gold suit, we must say) with some major announcements for the company. By supporting more direct B2C engagement in the omnichannel environment for such clients as Levi’s, Zendesk has seen 11 straight quarters of growth. Not resting on their laurels, ModSquad partner Zendesk is now coming to market with Sunshine (hence the suit), their own proprietary CRM platform. Svane described the tool — which is built in the public cloud on Amazon Web Services — as an effort to help businesses connect and understand all of their customer data, wherever it resides. Other new initiatives for the company include Zendesk Sell, a sales force automation tool, and data analytics tool Zendesk Explore. The conference also explored the customer-support environment as a whole, with in-depth discussions on trends (phone use is expected to rise, even as automation grows), insights (channel preferences vary by country, so support providers must adapt), and best practices (empathy, positivity, and trust are key to good support). Reps from other industry-leading companies offered presentations, from Box’s discussion on improving support via refined workflows to Uber’s tales of global customer support. While we were on the road, ModSquad kept the conversation going at a mix and mingle event, where we hosted VIPs from client companies like Scribd, IngramSpark, ShipStation, and other brands that don’t have an “S” in their name. It was an evening of fun chats, great food and drink, and general camaraderie. A good time was had by all. Finally, in San Diego, ModSquad COO Mike Pinkerton was invited by the Ethical Corporation to participate in their Data & Privacy speaker series during the Responsible Business Summit West. The talk focused on how the principles of free speech affect businesses in today’s environment, from social responsibilities and liabilities to how companies work to safeguard their brands. Weighty topics, perhaps, but by exploring which companies are leading the way in curating responsible online content while keeping the democratic free speech principles in mind, it was an aspirational discussion that demonstrated to attendees the power of effective moderation. That wraps up another whirlwind tour, where we were delighted to see so many clients, partners, and new friends. To all who met up with us along the way, our thanks. Keep an eye on the ModSquad blog for the next stirring adventures of the folks here at ModSquad!